I already did a mini review on the Warner Brothers version "A Game of Shadows". I recently posted on facebook that I was excited that "Sherlock" was back, referring to the BBC series. A few friends commented that they had already seen it and hoped I would enjoy it as well. I was confused because at the time it hadn't even aired in the UK. Did they get a leaked copy of the show? Obviously (but not to me at the time) they thought I meant the movie. Nope! This means that some of you don't know about the BBC version! 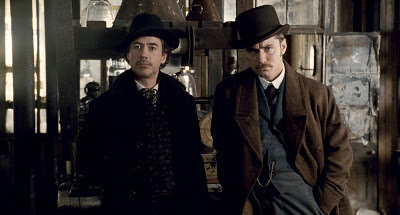 What I love about these current adaptations is that they stay true to the essence of Holmes' character and the adventures he and Watson have, while placing him in a different setting than we're used to seeing him in. In the movie, he keeps getting into violent situations where he gets to show off his martial arts skills as well as his deductive reasoning, predicting what his assailant(s) will do. In the TV show, Holmes and Watson are dropped into modern day London. 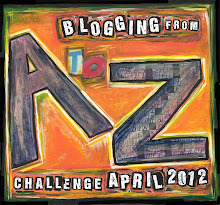 Watson blogs their adventures and Holmes is up on the latest tech. The BBC series stars Benedict Cumberbatch as Holmes and Martin Freeman as Dr. Watson. 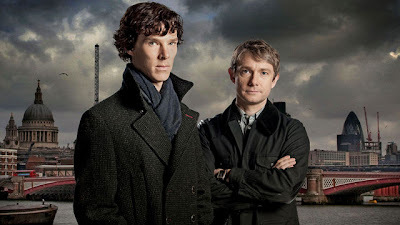 Writing and producing credits go to Stephen Moffat and Mark Gatiss, who also plays Mycroft. This is a sublime grouping of British comedy/drama royalty! Andrew Scott plays a wonderfully odd and eccentric Moriarty. Not a professor in this show; just Jim, with mysterious motives. I've seen the BBC version and LOVE it! I can't WAIT for more!!! I honestly (please don't tell hubby, he'll think I'm going nuts!) like it more then the WB movies!